View More In Heatsinks - Page 2. - 25Meters/82ft Length Thermal Conductive Tape. - High thermal conductivity performance and insulation, strong adhesion, which can be tightly and firmly fit the heat source devices and heat sink. - This strong adhesion and small thermal resistance features effectively replace the grease and mechanical fixation, Which make the heat sink and IC chip bonding, make high power LED and heat aluminum bonding, replaced screw fixed, to achieve the most effective thermal dissipation. - Used for attaching heat sink to CPU GPU, high power LED, chip set, LED TV field, Video Card RAM, DDR Memory Modules, SSD drives,ect. - Easy to use - Just stick on surface of any object and tear the blue release paper. 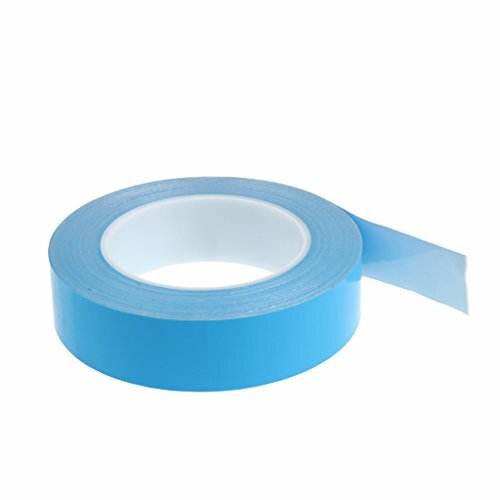 25Meters/82ft Length Thermal Conductive Tape. High thermal conductivity performance and insulation, strong adhesion, which can be tightly and firmly fit the heat source devices and heat sink. This strong adhesion and small thermal resistance features effectively replace the grease and mechanical fixation, Which make the heat sink and IC chip bonding, make high power LED and heat aluminum bonding, replaced screw fixed, to achieve the most effective thermal dissipation. Used for attaching heat sink to CPU GPU, high power LED, chip set, LED TV field, Video Card RAM, DDR Memory Modules, SSD drives,ect.